Kemah Boardwalk is a restaurant and amusement center overlooking Galveston Bay, located just 20 miles south of Houston, Texas. The 42-acre megaplex is one of the area's greatest attractions and not only boasts some of the finest seafood and shopping, but it also offers live musical entertainment. Discover all the exciting ways to spend the day (or weekend) on the Kemah Boardwalk, as well as what to know before you go. 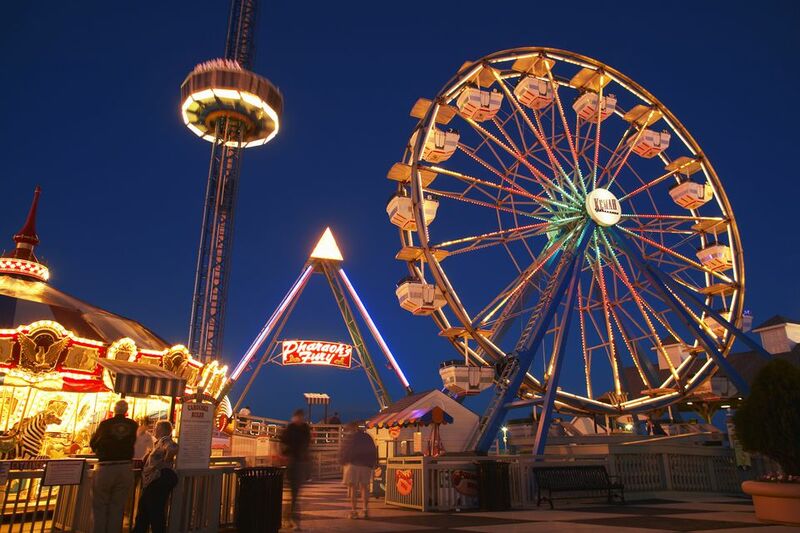 Kemah's amusement park has a wide variety of rides, ranging from a tame, child-friendly Ferris wheel to a gravity-defying rollercoaster. Younger kids will love the double-decker carousel and slow-moving train, while older, thrill-loving kids and adults might find the Drop Zone's 140-foot freefall more their speed. Boardwalk Beast —Spend 25 exciting minutes on this huge speedboat as it cruises through the Galveston Bay at speeds of up to 40 miles per hour. Adult tickets are $20 and children 12 and under are $15. Riders must be at least 36" tall, and discounts are available for military members with valid IDs. Stingray Reef & Rainforest Exhibit — At Stingray Reef, guests can get dive right in (hands only) and touch these fascinating sea creatures as they swim around their habitat. A nearby exhibit features snakes, scorpions, piranhas, and tarantulas — though you might not want to pet these guys. Boardwalk Bullet — If you're missing the Texas Cyclone that native Houstonians feared and loved for decades, the Texas Bullet may offer some consolation. This wooden coaster is 96' high with a 92' vertical fall. Overlooking the Galveston Bay, the Texas Bullet goes as fast as 51 miles per hour. The coaster is sometimes down for maintenance or because of weather conditions, so be sure to call ahead before heading to the park if this is a must-see for you. All-Day Ride Passes can be purchased anytime and include all rides except the Boardwalk Beast, Stingray Reef, Midway Games, and the arcade. Military veterans and active duty military personnel are also eligible for a discount with a valid military ID. Ask at the ticket counter to find out more. Prices for individual rides range from $4 to $20, though most rides are in the $4-5 range. *Note: Prices listed here are accurate as of December 2018, but may be subject to change. If you don't mind parking a little further away from the boardwalk, shuttle boat parking lots off of Texas Avenue are free. Closer lots and parking garage on-site cost $8. During spring break and weekends, however, all on-site parking is paid. If you want to celebrate a special birthday at Kemah, there are a number of options available. The Classic includes a 1-topping pizza, drinks, birthday cake, three ride tickets, eight arcade tokens, and balloons. The Deluxe includes a 1-topping pizza, drinks, birthday cake, all-day ride passes, 12 arcade tokens, and balloons. If you want a little more for your special day, you can add on additional items for extra fees, including tickets to the Boardwalk Beast, the Stingray Reef & Rainforest Exhibit, or individual ride tickets. You can add adults to your food and drink order for an additional fee. While places to cool down or warm up are sprinkled throughout the boardwalk, most of the action happens outside. Dress for the day's temperature, and be sure to wear a hat, sunglasses, and sunscreen pretty much year round.